look has gone, as the ears do not grow appreciably after 12 months of age. The whole body has become more thick-set, particularly the head and shoulders, and the fur is thick and glossy. Altogether, the young mature wombat is a sturdily handsome creature. It is at about this age that the wombat begins to display its scats by placing them in prominent positions instead of secreting them under cover. A home range has usually been established, and sexual maturity is fast approaching; the range must be 'signposted' at salient points with the wombat's scent, so that the owner can move about confidently in an environment that holds its own particular odour. As a young female approaches her first cycle of sexual 'heat', called the oestrous cycle, her scats, conspicuously displayed and with pheromones attached, act as scent bearers and convey the message that she is approaching oestrus to any male that passes by. In areas where the wombats live in a cluster of burrows there is usually more than one male alerted by the female's message, and fights between males often result. In less densely populated areas the female will wander beyond her usual home range, presumably in order to leave her sign where it is more likely to be encountered by a male. Most species of mammals have seasonal cycles of sexual activity, and in many marsupials this cycle occurs at the time of year which will ensure that the young emerge from the pouch in spring. As a wombat leaves the pouch at about nine to 10 months of age, this would mean that wombats would mate in late spring to early summer, giving birth about a month later. In the bare-nosed wombat, pouch young of all ages have been found at all times of the year. However, studies of this species in which the ages of a considerable number of pouch young have been estimated indicate that there are seasonal peaks in the time of breeding. In the highlands of New South Wales, most wombats give birth during the four months December to March, while in Tasmania Green and Rainbird found that, although births occurred at all times of the year, there appears to be definite bias towards October to January as a season for giving birth - 48% of births occurred in that four-month period. On Flinders Island, however, Green and Rainbird found evidence of seasonal breeding, as births occurred in the seven-month period between mid-January and the last week of August, with no births occurring in the other five months. Studies of the southern hairy-nosed wombat by Matt Gaughwin and others found that there is a definite breeding season, from July to December. Weaning occurs in late winter and spring and for enough high quality food to be available at this time there must have been good autumn rains to promote germination and to ensure the growth of grasses. If the autumn rains fail the grass will be dry and rank. Newly weaned wombats cannot cope with this food and many will die. It is also essential that there is adequate fresh, green grass throughout the summer so that the mothers can provide milk for the pouch young. It has been found that, if the young wombats survive for two years they are generally able to cope if there are drought conditions during their third year. This means that there must be at least two consecutive years of effective rainfall if there is to be an increase in the adult population. As there are many drought years in the areas where southerns live this increase rarely happens. The survival of the species depends on the adults living for many years so that they have some chance of successful reproduction. David Peters and Randy Rose studied the oestrous cycle in bare-nosed wombats and found that they are polyoestrous - that is, that they have a series of oestrous cycles during their breeding season, each cycle taking about 33 days to complete. By observing changes in the cells present in vaginal smears taken from the wombats, each cycle was found to consist of three distinct phases. The first, or pre-oestrous phase, occurs four to five days before the brief period, probably only about 15 hours, of oestrus or 'heat', during which ovulation occurs. The third phase, the post-oestrus, is of about four weeks' duration. During their study, Rose and Peters also measured the wombats' body temperatures, which showed the rhythm typical of nocturnal animals, with maximum temperatures occurring at night (from 9 pm to 6 am) and minimum temperatures during the day (from 10 am to 4 pm). However, they also found that other changes in body temperature occurred, which could have been related to the oestrous cycle. As the time of oestrus approaches, a female wombat becomes very active and aggressive, and during the brief 'heat' her urinogenital opening becomes moist and swollen. These signs have been observed in captive and hand-reared wombats. Mating has been observed in captive wombats; Graham Brown and Greg Young observed a mating between two captive bare-nosed wombats, the female attacking the male for about 30 minutes before allowing him to mate. During mating, which lasted for about 30 minutes, both wombats lay on their sides, the male holding the female around the chest. Similar behaviour has been seen in juvenile wombats during their play (see Plate 21). In the absence of reports of mating behaviour in wild wombats it was assumed that mating always took place in a burrow, and this is probably true of the hairy-nosed wombats, but Robert Taylor, observing bare-nosed wombats on pasture land in north-east Tasmania, saw behaviour that he interpreted as mating. Taylor observed two wombats moving around together, the male closely following the female, and several times putting his forepaws on her back as she kept moving. When he grabbed her back leg in his mouth the female lay on her belly. The male then lay on his side behind her, holding her rump between his legs. The female's back leg was lifted up due to the position of the male's body. The female stood up and moved away, dragging the male with her until he lost his grip. He then chased her again, and the sequence of grabbing her leg, stopping her, and lying behind her was repeated. When the male suddenly stopped holding her, the female rose and moved away. In 1990, using infrared equipment, Clive Marks observed and videotaped, courtship and mating behaviour in a pair of free-ranging wombats that was very similar to the incident described by Robert Taylor. Marks observed a pair of wombats on open pasture for 25 minutes, during which time a series of repeated behaviours took place. Courtship behaviour consisted of the male chasing the female while she trotted around in wide circles and figures of eight; periodically she would slow down, allowing the male to catch up with her (Figure 6.12a). After about two minutes of this chasing behaviour, the male delivered a powerful bite to the female's rump (Figure 6.12b). At once, the female stopped running (Figure 6.12c); the male then grasped her hindquarters with his forelimbs, rolled her over on her side and mounted her. While they were copulating, the female rolled over into the prone position (Figure 6.12d). After several minutes, the female rose and broke into a half run, pursued by the male, and the chasing behaviour began again. Marks saw this sequence of behaviours - the chase in circles and figures of eight, the male's bite to the female's hindquarters causing her to stop running and allowing him to mount, the female breaking away from copulation to resume the chasing behaviour - repeated seven times over the 25 minutes. tend to make wombats move away to cover, but Marks' infrared observation equipment, producing no visible light, did not disturb them. Once mating has occurred, the male plays no further part in the reproductive process. No kind of bond is formed between male and female, nor does the male have anything to do with the rearing of the young. If, following mating, the female becomes pregnant, her oestrous cycles cease and probably do not start again until some time after the young is weaned. 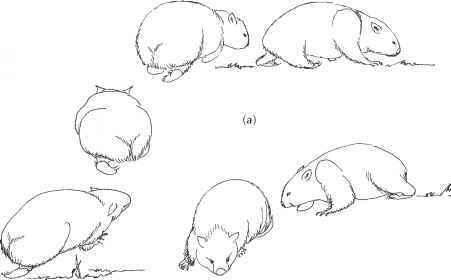 None of the female wombats examined by Green and Rainbird showed evidence of pregnancy during lactation. Unlike kangaroos, which usually give birth to a second young as soon as one leaves the pouch, wombats do not appear to breed again until the young is fully independent. 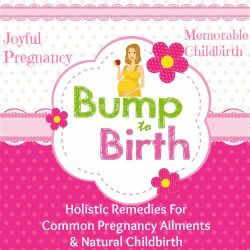 This can take as long as 20 months or more - one month of gestation, 8-10 months in the pouch and up to 11 months at heel. If the young becomes independent at about 15 months, which seems to be the average age, and the female breeds again almost immediately, she could rear one young every 16 months. In Tasmania, Green and Rainbird found that most females suckled their young for almost a year, and that weaning was followed by a period of rest; they concluded that the breeding cycle is longer than a year. McIlroy has some evidence that, if the mother dismisses her young at heel at an earlier age than usual, perhaps in response to good seasonal conditions, she may breed again and thus rear one young per year. McIlroy's observations also indicate that a female may breed again soon after the early loss of a pouch young. All these factors probably account for the spread of the time of breeding. After the young has been weaned, some female wombats, of all three species, disperse to other areas. It has been suggested that this is a kind of maternal investment since it allows their burrows to be used by their offspring, who might have difficulty in finding a burrow of their own. Hair censusing has also shown that male southern hairy-nosed wombats are philopatric - that is, they tend to live close to where they were born. This is also true of the other two species.